On an Instagram post, Manny Pacquiao had shared the reasons why the bout against Floyd Mayweather Jr is very important for him. It is no secret that Pacquiao and his team are aggressive about making the fight reality and he now reveals the real reasons why. 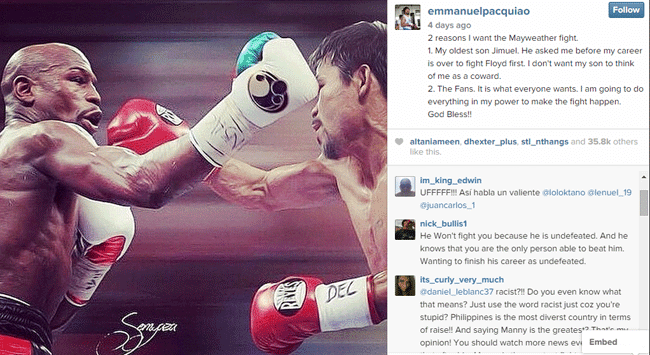 According to Pacman’s post, the very first reason that he wanted to fight Mayweather is his son Jimuel. Apparently, the boy asked him to fight the undefeated American icon before he retires. He did not want his son to think that he is a coward. The second reason are the boxing fans. He knew it was what everyone wants and promised to do everything he can to make the fight into a reality. The most awaited fight was dubbed as ‘megafight’. Mayweather and Pacquiao are considered one of the best boxers in the world which makes the fight very exciting. It has been years since the two camps were reportedly working on an agreement to make the fight happen they hadn’t reached a contract yet. The two boxers took to social media expressing jeers on each other. Pacquiao had been very vocal about wanting to fight Mayweather but the American remained silent about the fight. It was December 13, 2014 when Mayweather finally verbally accepted the challenge but also took the opportunity to say that it was Pacquiao’s team who kept on ducking the possibility of the fight. 2 reasons I want the Mayweather fight. 1. My oldest son Jimuel. He asked me before my career is over to fight Floyd first. I don't want my son to think of me as a coward. 2. The Fans. It is what everyone wants. I am going to do everything in my power to make the fight happen. God Bless!! Pacquiao then answered Mayweather’s statement by saying that the American must first sign the contract before he believes that the fight will actually happen. Many netizens seconded Pacquiao’s challenge and says that Mayweather should sign the contract and only then that they will be sure that the megafight will happen.